Secretary-General António Guterres addresses the urgently convened Security Council meeting on Syria. 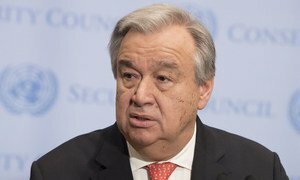 In an address to an emergency meeting of the Security Council on Saturday, United Nations Secretary-General António Guterres cautioned against the crisis in Syria “spiraling out of control." The meeting was held following overnight airstrikes in Syria launched by the United States, with support from France and the United Kingdom, which targeted installations connected to the country’s chemical weapons capabilities. It was called by Russia which failed to get the other 14 Council members to adopt a resolution condemning the airstrikes. Speaking prior to the vote on the draft resolution, the Secretary-General urged countries to avoid actions that would escalate the situation in Syria and worsen the suffering of its people. “As Secretary-General of the United Nations, it is my duty to remind Member States that there is an obligation, particularly when dealing with matters of peace and security, to act consistently with the Charter of the United Nations and with international law in general,” he told ambassadors, echoing a statement issued in the wake of the airstrikes. “As I did yesterday, I stress the need to avoid the situation from spiraling out of control," he continued, referring to a meeting held on Friday, one of five times the Council met this week to take up the question of Syria. The US and its allies launched the airstrikes in response to last week’s suspected chemical attack in the Syrian city of Douma. “More than 70 people sheltering in basements have reportedly died, with 43 of those deaths related to symptoms consistent with exposure to highly toxic chemicals,” according to an agency statement on Wednesday. UN partner the Organisation for the Prohibition of Chemical Weapons (OPCW) has dispatched a fact-finding team to the location. The airstrikes were reportedly limited to three military locations, but the Secretary-General said the UN is unable to independently verify these details or if there were any casualties. Russian President Vladimir Putin has condemned the airstrikes as “an act of aggression,” the country’s representative informed the Council. “This is hooliganism in international relations, and not minor hooliganism given that we’re talking about major nuclear powers,” Ambassador Vassily Nebenzia said. US Ambassador Nikki Haley defended the joint operation with France and the UK, expressing confidence that the airstrikes had “crippled” Syria’s chemical weapons programme. “With yesterday’s military action, our message was crystal clear. The United States of America will not allow the Assad regime to continue to use chemical weapons,” she said. Nikki Haley, United States Permanent Representative to the UN, addresses the Security Council meeting on threats to international peace and security in relation to the situation in the Middle East. For UK Ambassador Karen Pierce, Syria has presented one of the most serious challenges to international efforts on non-proliferation. The Syrian crisis is now in its eighth year, and is the most serious threat to international peace and security, as the UN chief stated in his briefing. “In Syria, we see confrontations and proxy wars involving several national armies, a number of armed opposition groups, many national and international militia, foreign fighters from everywhere in the world, and various terrorist organizations,” he said. The Secretary-General reiterated that there is no military solution to the crisis, only a political one. French Ambassador François Delattre said the three allies will submit a draft resolution aimed at finding a political solution to the Syrian crisis. “When it ordered the chemical attack on 7 April, the Syrian regime knew fully what it was doing. Once again, it wanted to test the limit of tolerance of the international community – and it found it,” he said.